Louisville got its name from the French King Louis XVI and proudly bears the fleur-de-lis as its symbol. 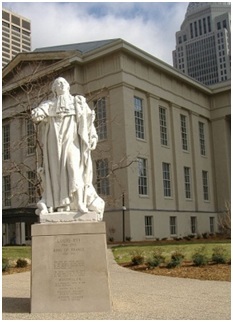 A statue of the king stands outside the Jefferson County Courthouse in downtown Louisville. The Unofficial Fan Site of the City of Louisville identifies the King as “The guy whose Frenchness causes there to be no "S" sound in the word "Louisville." However, the French were just one of the ethnic groups that influenced early Louisville and made it the diverse multicultural community it is today. Currently, there over 600,000 people in the greater metro area, representing more than 60 nationalities. Aside from the foreign multi-cultural influences, Louisville has Southern and Midwestern roots to factor in too. 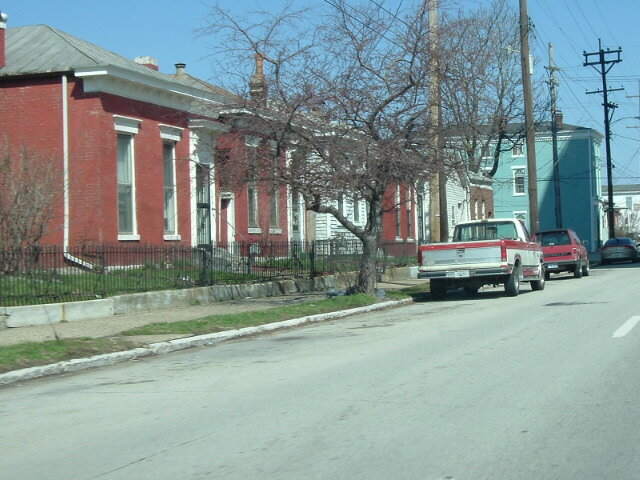 Louisville has been described as "the most northern southern city" and "the most southern northern city." Offering grace and charm often associated with the South, Louisville has a “native” cuisine based there as well. Barbeque and bourbon, biscuits and ham, Kentucky Hots Browns, pecan pie (often with chocolate and bourbon mixed in), and other Southern-influenced delicacies have made Louisville a frequent finalist in Southern Living Magazine’s annual contest to determine the tastiest towns in the country. Shortly after its founding in 1787 by George Rogers Clark, European immigrants flooded into the city. TheEnglish, the French, and particularly the Germans came in waves reflecting political unrest in Europe and left their mark on city. Louisville's location on the Ohio River made it an early shipping port for goods that traveled along the Mississippi River to New Orleans. 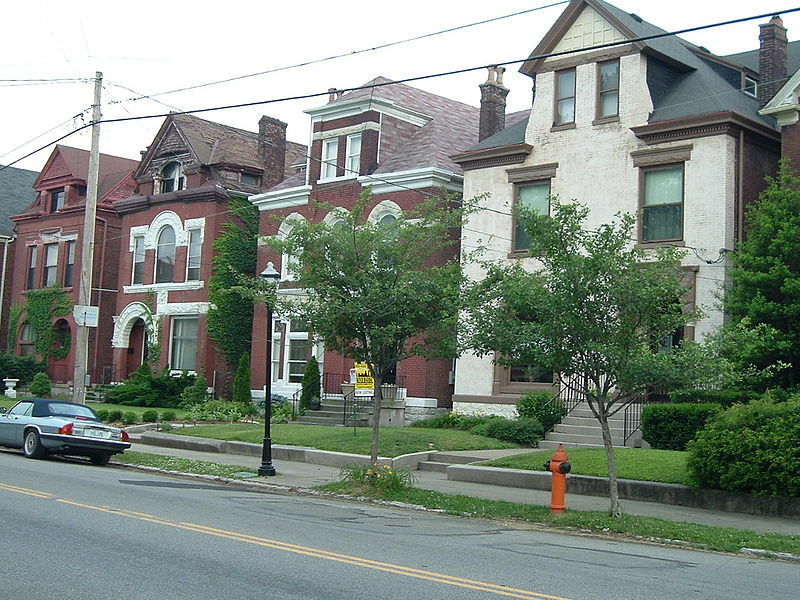 These foreign-born Louisville residents settled in neighborhoods like Germantown, Paristown, Irish Hill, Schnitzelburg, Limerick, Kensington, or Cambridge neighborhoods, which were named after their ethnicity. Germans: Germans were among the first Louisville settlers in 1787; within 60 years they made up 35% of Louisville's population. Many people of German origin were brewers, butchers, and tanners, crafts outlawed in the city. Their early settlement on the outskirts of town became Butchertown, a meatpacking district. Today, the JB Swift Company still has a plant that gives a smoky smell to the area. Products from early German meatpacking companies are still popular in Louisville today, such as meat from the Fischer Packing Company. Though the early brewing industry died out for a time, now microbreweries abound in modern Louisville. Today, Louisville enjoys German culture by visiting the city's legendary breweries and by attending the tribute to German forwarding culture held every October, the Oktoberfest. Irish: Early Irish settlers in Louisville worked in the candle making, grocery, and boarding house trades but later they provided invaluable labor to the Louisville and Nashville Railroad. Many lived in the Limerick district of Louisville, but later moved to the Highlands when the railroad moved there. Until 1917, Limerick hosted a popular St. Patrick's Day parade. By the 1960s, interest in Irish culture increased and the parade was started up in the earliest 1970s. Today, the parade attracts more Irish music fans than any Midwest city except Chicago. Louisville currently has a strong Irish pub district around Baxter Avenue, where O'Shea's, Dublin's Cellar, Molly Malone's, Flanagan's, and The Irish Rover serve beer and Irish food all year long. six cities with the largest black population s by 1900, so Louisville figured in urbanizing a formerly rural culture. Black Louisvillians had large settlements at Berrytown, Griffytown, Harrods Creek, Parkland, Russell, Smoketown, and other locations now designated with historic markers around the city. Louisville history has been enriched by many famous African-Americans. Native son Muhammed Ali is commemorated at a center in downtown Louisville that promotes his values of respect, confidence, conviction, dedication, charity, and spirituality. Louisville commemorates and remember with an oral history project and exhibits at UofL , at the Ali Center, and around the city. Events such as the annual Corn Island Storytelling Festival each fall and the annual West Louisville Appreciation Celebration and Family Reunion acquaint the city with African American culture. 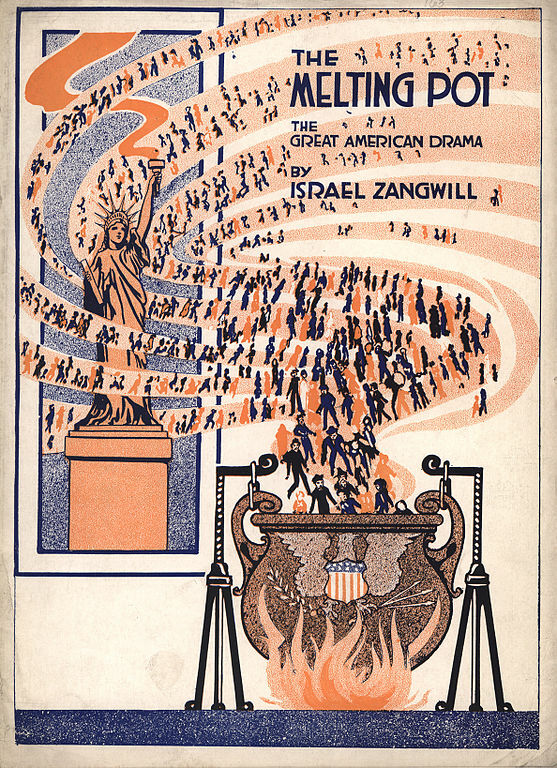 Jews: The influx of Jewish immigrants has been steady, with many of the early Jewish settlers originating from Germany or Poland, with more recent ones coming from Russia. Aside from their important role in the commercial development of our city, they have contributed to our cultural, religious, and philanthropic diversity. Jewish Hospital, founded in 1903, is now a regional network of over 50 healthcare facilities and is one of the area’s largest hospitals. Ironically, Jewish butchers introduced Irish settlers to affordable corned beef. While corned beef was a delicacy reserved for export and for the rich in Ireland, it was so plentiful in Louisville that the Irish replaced the bacon in traditional recipes with the corned beef offered by local butchers. Asians: Chinese immigrants came to Louisville in the 1920s and opened laundries and restaurants, but now residents from Vietnam, Laos, Thailand the Philippines, South Korea, India and Pakistan enrich the local community. Many highly educated professionals of Asian descent work at Louisville's hospitals and universities, but others have expanded Louisville's culinary and business horizon. Middle Eastern: Lebanese-Syrian families have been citizens of Louisville for over 100 years .Originally merchants, their descendents sell good sin the Haymarket today. More recently, new immigrants from the Middle East have brought Islamic culture, cuisine, and institutions to Louisville, as new mosques and orthodox churches dot the landscape. Hispanic/Latinos: Though latecomers to the Louisville, Hispanics are the largest-growing ethnic group in the region. Coming from Mexico, Argentina, Cuba, Latin America, and Caribbean, the new residents have opened restaurants and other businesses and made contributions to the local art scene. The mix of residents in Louisville is quite different than it was a century or two ago, while Louisvillians’ perceptions of themselves has as well.. According to the 2000 census 11.5% of Louisville residents considered themselves "American," and 42.9% identify themselves as "other," considered to be a mix of Hispanics and African-Americans. However, 14.6% consider themselves German, 9.4% Irish, 7.2% English, 1.7% Italian, 1.5% Scotch Irish, 1.3% Scottish, and 1.2% French, with many other nationalities weighed in at 1% or less. Though many cultures made Louisville into what it is today, the past is often remembered in festivals with an ethnic theme and in the many restaurants of Louisville, which offer an excellent selection of food from many cultures. Many local markets carry ingredients for international cooking. For example, Lotsa Pasta on Lexington Rd carries Italian, Asian, and supplies, plus a selection of homemade Italians food. Chinese – Oriental Grocery, Bardstown Rd. Indian – Shalimar on S. Hurstbourne Parkway. Russian – Golden Key International Food on Bardstown Rd. Vietnamese – Binh Phuoc on Third St.
Louisville continually incorporates new cultural influences to make it even more cosmopolitan than it has traditionally been. Dubbed Possibility City, the city endeavors to make the possibilities open to all as it welcomes new residents – and it encourages all Louisville to learn about the new cultures. Almost every weekend from March through October, neighborhood festivals held around Louisville celebrate the heritage of its citizens and introduce various cultures to you. One of the best ways to learn about the cultures that make up cosmopolitan Louisville is to attend the annual WorldFest held every Labor Day weekend. Spotlighting the many cultures in Louisville, the event features a naturalization ceremony for new citizens. There is a Parade of Culture, unique booths for shopping, music of the world, and an assortment of ethnic foods available to sample and enjoy. Rounding out the festival is The World of Children, which offers international games and crafts geared toward younger visitors.